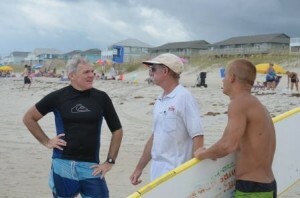 North Carolina Sea Grant’s research into rip current circulation drew national attention this summer. Rob Brander, Spencer Rogers and Cobi Christiansen discuss drifter deployment at Carolina Beach. Photo by Kurt Christiansen. So, what is a data-logging drifter? “It records position over time. It also can record velocities, so we don’t have to do it manually,” explains Cobi Christiansen, who is gathering and analyzing GPS and other data for his graduate studies at the University of North Carolina Wilmington. The drifters are made from readily available plumbing materials, along with small, off-the-shelf GPS units. Gym weights and insulation combine to allow each drifter to float like a person would. Spencer Rogers, Sea Grant coastal construction and erosion specialist, is leading a team of researchers and volunteers focused on beach safety. “In North Carolina, the ‘rip current danger’ on most beaches is only about five days a year,” he says. 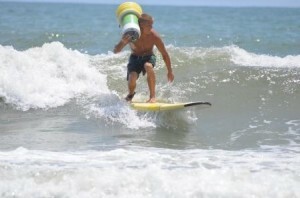 Christiansen retrieves a drifter that was ejected by a rip current on Carolina Beach. Photo by Kurt Christiansen. Rob Brander — a coastal geomorphologist from the University of New South Wales in Sydney, Australia — is contributing his expertise while visiting the United States to study rip currents. Other partners include National Weather Service offices, as well as local ocean rescue programs. After several test deployments in partnership with Carolina Beach Ocean Rescue and the Wilmington NWS office, the research team went “on call” for several weeks in New Hanover County to deploy drifters when strong rip currents were reported. The team then headed to the Outer Banks to work with partners there. Watch for a more detailed story in a future issue of Coastwatch. This article was published in the Autumn 2014 issue of Coastwatch.